If you want to have seamless steel siding installed on your home in the Kansas City, Missouri, area, you can confidently turn to Kent Mohler Exteriors. Since our company’s founding in 1975, we have established and maintained a reputation for offering excellent home remodeling products, installed by experienced professionals, at reasonable prices. 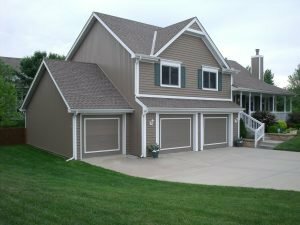 One of the main reasons why so many homeowners in the Kansas City, MO, area choose us to install siding on their homes is because we offer only top-of-the-line products. Due to its galvanized steel construction, our siding won’t warp or crack over time. What’s more, our steel siding is seamless and is custom rolled on site to fit the exact specifications of their homes. That means there will be no unsightly seams where dirt can collect or insects can nest. Best of all, the steel siding we offer is backed by a limited lifetime warranty. This means you can have total peace of mind in your investment. To learn more about the benefits of having seamless steel siding installed on your home, contact Kent Mohler Exteriors today. We would be happy to set up a free consultation at your home in or around Kansas City, MO.